Hi loves! How are you today? Hope you are doing fine! 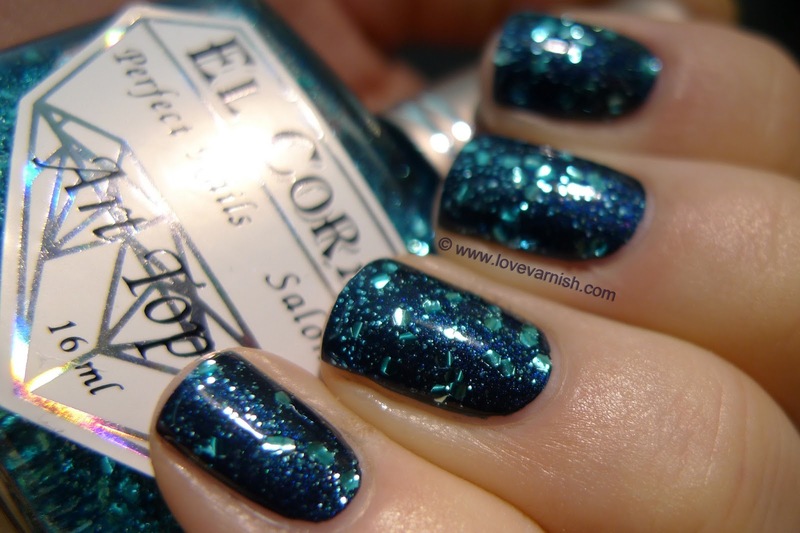 I am showing you 3 out of 6 El Corazon Art Topcoats today. I tried to come up with fun combinations but felt it was kinda hard. These glitters are not for the shy and they do draw attention! IMPORTANT: It looks like some glitter is curling. They are NOT. It is reflective curling, the glitter did not clump and did not stick out on my nail. They are actually smooth with 1 layer of normal topcoat. I included a picture with the view straight on my tips to show you. All glitter is 1 coat. Let's start with Cinderella's First Ball. 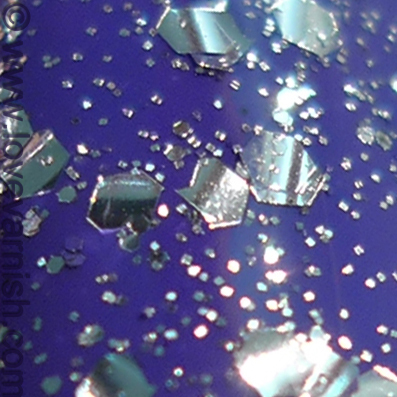 Clear base with small glitter and large hexes in a bright blue color. I chose to layer this one over China Glaze Little Drummer Boy (1 coat). I used 1 coat of this glitter bomb and it applied easy. I did some minor placing, to spread the large hexes a bit more even. 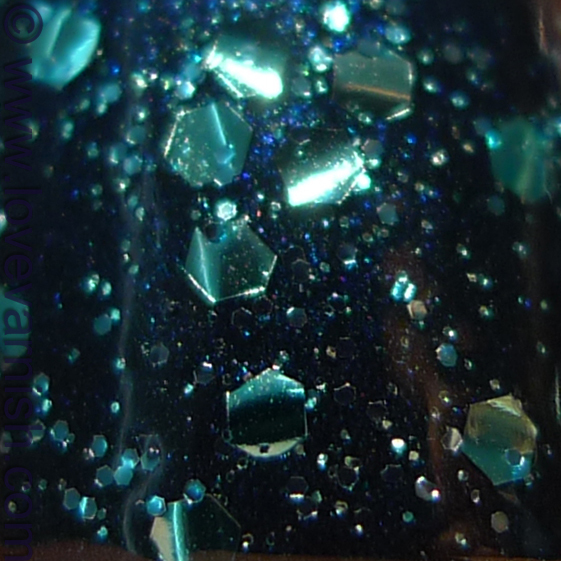 What I like is that there is very small glitter in the base, pulling the look more together. But, for my personal taste I would have preferred if there had been medium sized hexes too, for balance. Next up is Drops Of Dew. Clear base with small glitter and large hexes in silver. Same polish as the previous one just a different color glitter. This one was layered over H&M Notoriously Beautiful (1 coat). Again 1 coat of the glitterbomb and again it applied easy, just some minor helping in the spreading of the glitter. I also have the same remarks about the looks of this one as I had with the previous shown ;-). 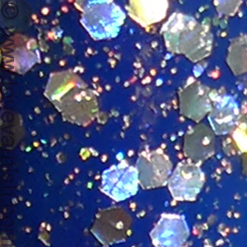 Last one for today is Holiday Confetti. Clear base with small glitter and large hexes in silver holographic. Another H&M as a base, this time Something Blue. Again, 1 coat of my base, and 1 coat of the glitter. Somehow on my index I had less glitter, but the formula is quite the same as the other 2. Slightly thick, lots of glitter, easy to apply and some minor glitter spreading. Again, medium hexes would have brought more balance for me in this polish! What is your favorite out of the three? And how would you have combined them? Holiday confetti is my favorite! It is pretty right :D? Thanks for your comment!